Is Your Company Thinking Enough? | Challenger, Gray & Christmas, Inc. So, how can companies combat these distractions and make better decisions? “Companies would be smart to realize that email, social media, text messaging, and other tools for quick and efficient communication, can be major distractions in the workplace, especially when trying to make sound decisions and creating strategy,” said John Challenger, chief executive officer of global outplacement and executive coaching firm, Challenger, Gray & Christmas, Inc.
“While reducing technology could lead to fewer mistakes and foster a more creative and focused workforce, screens and pings have become ubiquitous in our home and work life. Switching off tech during workdays is no easy feat,” said Challenger. In fact, a 2017 report by Radicati Group found that office workers receive 121 emails per day, with 269 billion emails sent every day. “The sheer amount of email workers receive deters them from doing anything else but clear their inboxes. It is no wonder that workers are checking and responding to emails during important meetings and strategy sessions,” said Challenger. However, multitasking by checking emails or texts during meetings slows down the decision making process and is viewed as unacceptable by other meeting participants. A 2003 study entitled Perceptions of Civility for Mobile Phone Use in Formal and Informal Meetings found that 76 percent of employees believe checking emails or texts during meetings is unacceptable. Meanwhile, a 2014 study published in ScienceDaily in conjunction with the University of British Columbia found that checking email is a significant stressor for employees. Switching between taking notes, responding to emails, checking Facebook, and scheduling meetings not only detracts from each individual task but also causes workers additional stress, not an ideal atmosphere for decision-making. “Employers should encourage employees to set goals for how long to focus on a task without distraction and to use only one screen at a time. Employers can also install anti-distraction programs to help workers remain on task. While these measures are not fool-proof, they can lead to a more productive workday and better time management. “Successful people and organizations know when to pull back in order to make the decisions necessary to complete projects and advance strategy. Another way companies can ensure time is spent on these important decisions is to institute “no-tech” days a few times per month,” offered Challenger. Indeed, Warren Buffett estimates that he has spent 80 percent of his career thinking and reading, while AOL CEO Tim Armstrong instructs management to spend 4 hours per week just thinking, according to an 2016 INC post. Reducing technology use can save time in the decision making process, but the key to effective decision making is thinking and planning. According to the same INC article, the ideal decision will have “maximum impact with minimum intervention” much like a surgery. In order to make these concise, impactful decisions, management needs to spend more time planning than acting. While there is no secret formula to making perfect decisions all the time, removing distracting technology and effectively planning can help management make decisions that are more impactful. 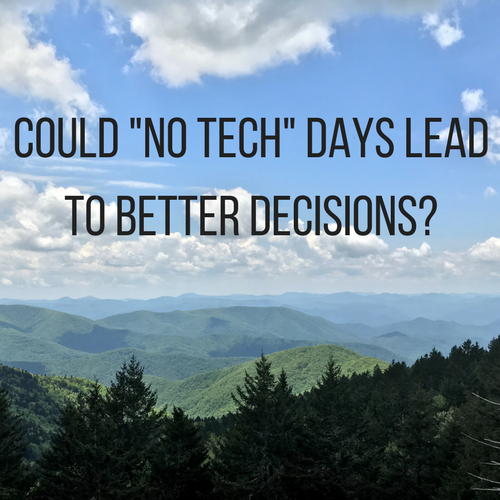 Take Away the Tech: “No-Tech Days” may not be popular at first, but the result is a workforce dedicated to solving pressing issues and making decisions that will contribute to the company’s overall strategy, potentially positively impact the bottom line. Write Instead of Type: Studies have shown that writing notes during meetings helps employees retain information rather than typing them, according to a 2014 study published in Psychological Science called The Pen Is Mightier Than the Keyboard: Advantages of Longhand Over Laptop Note Taking. Moreover, your teammates will view writing notes more favorably than if you are on a tablet or computer, where you might be checking email or social media. Plan, Plan, Plan: This means thinking through all possible outcomes from beginning to end for a potential decision. What are the options, what are the short- and long-term effects of those options, and what are some solutions to problems that may arise from implementing those options? Lead by Example: If you want your workforce to spend more time thinking on important decisions, management should make it a priority and act accordingly. Manage expectations about responding to and sending emails and texts, especially after hours. This will alleviate stress and allow workers and leaders to focus on making decisions and implementing strategy.